Knee pain can happen to anyone: the new runner who ran too much too soon. Or the marathon runner who trained too hard. It’s unfortunate, uncomfortable, and it can keep us from what we love doing the most – running! Thankfully, there are some great running shoes that can combat knee pain and help provide a better running experience. There are a variety of causes for knee pain, and for most, you should get checked out by a doctor before getting back to running. You might have poor alignment in your feet, legs, or hips. You might be overpronating (rolling your feet inwards when you walk). Or you might have arthritis or a torn ligament. If you’ve gotten your doctor’s ok to start running again, here are ten shoes that will help cushion your knees and joints for a run that feels great. The Gaviota from Hoka is the company’s go-to for overpronators. With more cushion and stability than even the Arahi (another Hoka shoe), the Gaviota is one of Hoka’s softest running shoes plus it has enough stability to correct overpronation. A common cause of knee pain comes from the runner’s foot rolling in too much (overpronating). It’s not uncommon to find that a good shoe fixes those problems, both by providing extra cushion and comfort and by helping to control and guide the the feet during the running gait. The Gaviota does both, thanks to its J-Frame technology. The J-Frame is a j-shaped support network engineered throughout the shoe to provide medial (inside) support to your feet, which is exactly where it’s needed when you’re having knee problems caused by overpronation. 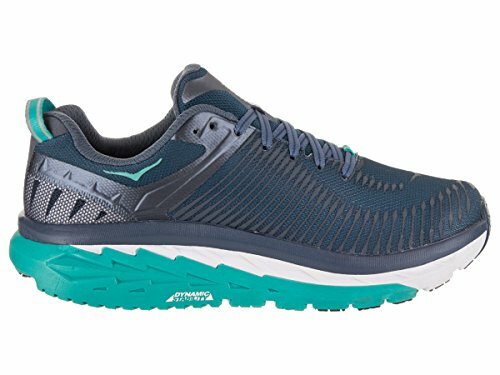 Thanks to EVA foam and rubber, the cushion on this shoe might be described as “cloud-like.” In fact, the Gaviota is one of Hoka’s softest shoes! Another great shoe from Hoka One One, the Bondi 6 provides some serious cushion power. Utilizing many of the same technologies as the Gaviota, this model provides 43.5mm of cushion right at the heel. Whether you’re looking for a road warrior or a trail marathon running partner, this is a great option. Thanks to the Bondi’s deep cushioning, runners report feeling like the shoe conforms to their feet so that they’re running in their shoes, not on. 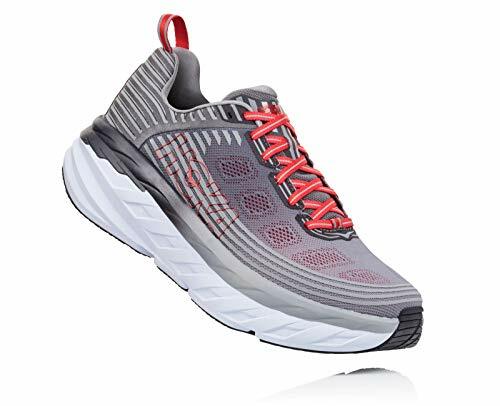 Even though Hoka markets this shoe as a neutral shoe, it has enough support to help mild overpronators – the shoe is very stiff and helps guide the foot into the correct running stride. It has a steady curve on the bottom of the shoe, which helps smooth the transition while running. It also provides enough stiffness that it can often help runners with arthritic toes. You’ll notice great response on the heel, as well as a sleek look. The Bondi looks kind of funky with it’s high stack height – but it’s soft ride will help ease any knee pain you’re experiencing. The Glycerin 17 is plush, ultra-cushioned running shoe, making it a great option for people whose knees are actively hurting. It’s 10.4 oz, which is a little on the heavier side compared to other running shoes. But what it gains in weight it makes up for in overall comfort. Thanks to the DNA Loft foam in the midsole, runners in this shoe enjoy plush cushioning that lasts for many miles. The shoe is surprisingly responsive. But the big features here is the soft cushioning. This helps take the pressure of the outer corner of the knee, relieving pain and discomfort. Cushion in the heel adds to the overall soft landing for the Glycerin. A new seamless upper provides a nice look to the shoe. No stitching in the upper also keeps the shoe light and reduces potential irritation. Overall, the soft cushioning is what’s needed with knee pain. While not as cushioned as Hokas, the Glycerin 17 has a more traditional running shoe look. The Clifton 5 from Hoka is their best-selling model. 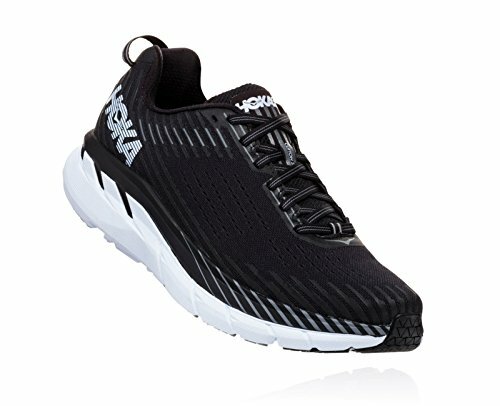 It’s lightweight, has great cushioning, and looks a little more “shoe-like” than some of Hoka’s other models. It has a mesh overlay and foam platform which combine to create a very powerful show from a well-respected company. 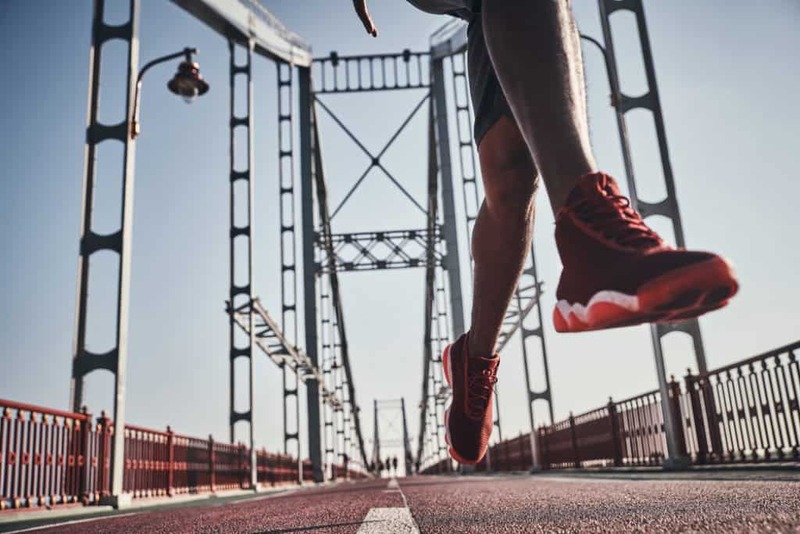 The 37mm of cushion at the heel gives you an idea of the kind of foam and comfort available on this shoe, but runners report that even with all the extra cushiong (which translates to less pressure on your joints, including knees), the Clifton is still very responsive. Tight, firm mesh makes this shoe breathable, which you’ll love if the weather is hot and humid or you just have trouble keeping your feet dry. This is actually an upgrade from previous Cliftons that had a less porous mesh and didn’t prove to be very durable. This version has already shown itself to be more durable. The shoe weighs in on the lighter side for a cushioned shoe (10oz), but you might still feel like it’s heavy if you’re used to a normal trainer. Either way, this shoe will provide the padding to go the distance without increasing knee pain. 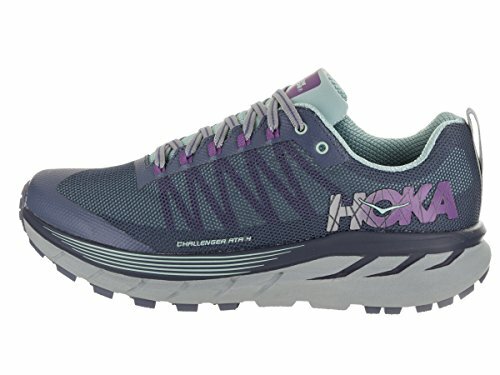 Similar to the Clifton from Hoka, the Challenger is optimal for trail runners who have bad knees. With its all-terrain sole and low drop (only 5mm), it provides great traction and stability over light to moderate trails. The Challenger’s oversized EVA midsole provides firm comfort where it’s needed, and the dual layer mesh upper provides additional protection from gravel, rocks, and sticks. The shoe has 4mm lugs on the sole that shed mud and grip the trail, helping to keep you dialed in on the trails. 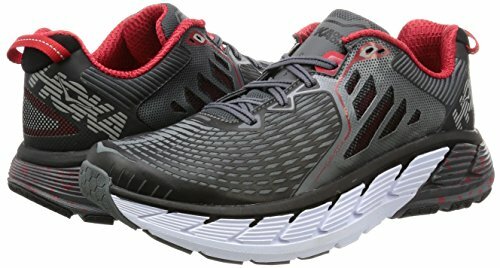 At 9oz, this is a lightweight shoe for a cushioned trail shoe. The extra cushioning will help mitigate knee pain. The meta-rocker midsole helps to push your foot forward so you don’t heel strike. 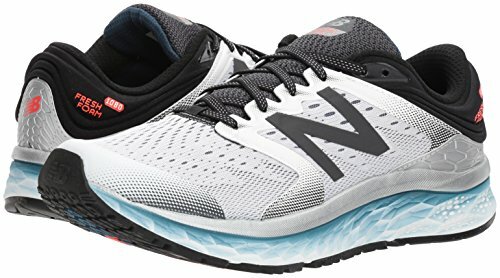 The 1080 from New Balance is a neutral shoe that provides high levels of support for your knees, shin splints, or plantar fasciitis, even if you don’t pronate or supinate. The upper’s engineered mesh is comfortable thanks to its breathability, plus its toe cap is supportive and helps to provide extra stability, keeping your foot on the supportive platform. This model tends to run wide, so if you have a wide foot, you’ll appreciate this shoe’s construction. The Fresh Foam midsole powers through with support and comfort. Your aching knees will rejoice when your feet sink down into the plush lining and comfort-optimized sole. 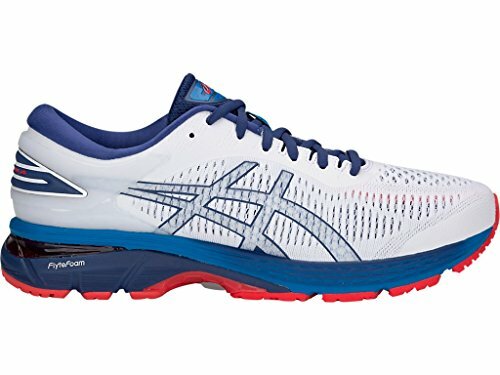 The Fortitude from Asics is a great shoe with solid cushioning in place for all-day walking or running. What people with knee pain especially appreciate about this shoe is its ability to take an orthotic. Whether it’s an over the counter insert or you’ve been prescribed a custom orthotic or wedge by your podiatrist, having that extra room prevents the top of your foot from being squished inside the shoe. Thanks to its wide toe box, the Fortitude is also highly suitable for particular tall or heavyset individuals. The gel cushioning system is strong yet light and helps to reduce shock during the impact phase and propulsion. This means the impact stops at the heel and doesn’t travel up to your knees. An upper directional mesh upper with stretch reinforcements adapts on the fly to the shape of your foot. The Asics Gel-Kayano 25 is a great shoe with tons of cushioning and stability to protect your knees. 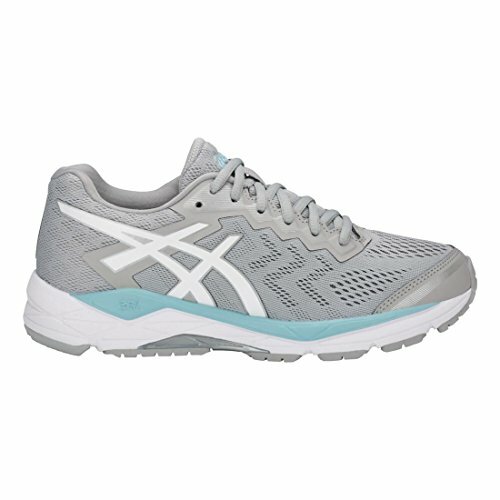 This most recent version of the Kayano is enhanced by Asics’ FlyteFoam, a high-performance, lightweight foam. FlyteFoam is composed of reinforced fibers in foam. It manages to add the stability and strength your tired knees crave, yet does so without added weight. You’ll find the cushioning feels firm and responsive, but molds to your feet for comfort all day long. This is a shoe designed for overpronators, perfect since if you’re dealing with knee pain, there’s a good chance you’re overpronating. Also new in version 25 is a redesigned upper that’s breathable and has some stretch. But the Kayano maintains its plush feel combined with a snug fit in the midfoot and heel. The Arahi from Hoka One One is designed for overpronators who don’t want the inflexibility and rigidity that normally comes with stability shoes. In this iteration of the Arahi, you’ll find what Hoka calls its J-Frame technology. The J-Frame technology is a piece of j-shaped engineered foam designed to provide strength where you need it (along the medial or inside edge of your shoe) and comfort and cushion where you need it (along the heel and lateral edges). This innovative design cuts down on weight and provides a cushioned, responsive ride without unforgiving, stiff materials. Reviewers love the stability this shoe provides, perfect for those conscious of causing further injury to knees, shins, or ankles. 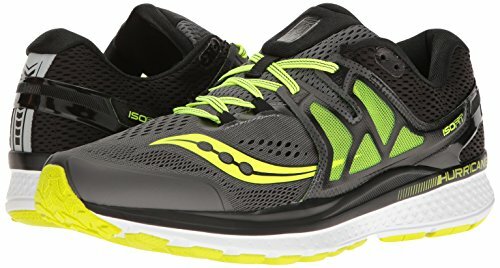 If you’re a fan of Saucony’s fantastic running shoes and you have knee pain, this is the perfect shoe for you. Great for moderate overpronators, this shoe has cushion, stability, and performance features built-in throughout. Saucony’s EVERUN technology might be popular across its lines, but that doesn’t mean it’s not still impressive. The EVERUN landing zone under the heel creates a sort of trampoline effect that provides you with maximum responsiveness and more performance with less energy output. Reviewers note that the energy on this shoe is great – they feel faster – and the flexibility of the ISOFIT system adapts to their feet, so they get a customized feel. The inner layer is moisture wicking for added comfort. Does running cause bad knees? 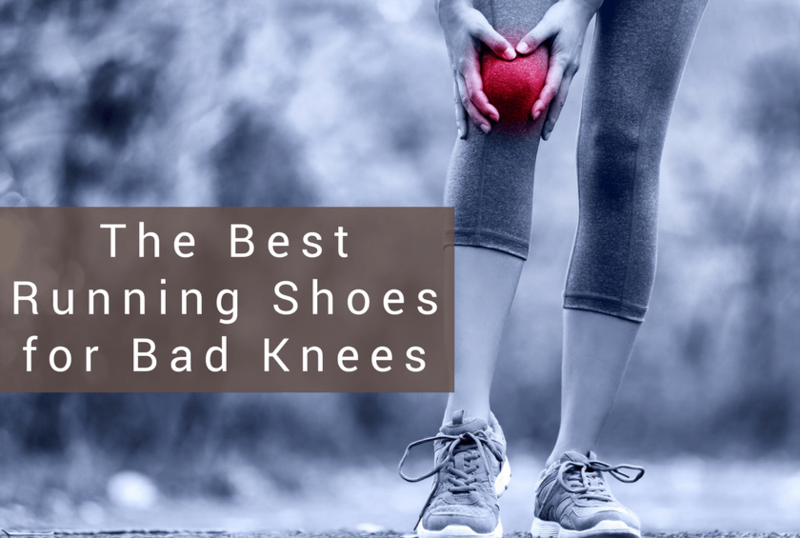 Whether you are training for your first 5K or a seasoned runner who cranks out five miles every day, you have probably heard that running can cause bad knees. But according to WebMd, running only hurts your knees when done incorrectly. Most runners who have poor running form will eventually develop a knee injury. While some of these form issues may be the result of conditioning, others are simply due to physical makeup. If you are a runner with a tilted pelvis, extra weight, or a short leg, you are more likely to encounter knee problems than runners without these concerns. Listening to music as you run may also contribute to poor form. When most runners are listening to their music, they neglect to tune into their bodies during the run. As a result, they are not able to make the proper adjustments to their form. That being said, other issues can cause knee problems while running. Runners who run too much too soon are at risk of damaging muscles, ligaments, and joints that are not strong enough to withstand the intense activity. New runners shouldn’t run more than three or four times a week. The other potential fast track to knee injury is wearing the wrong shoes. Long-lasting, sturdy running shoes with a comfy cushion are a great choice for most runners. Can running help with bad knees? According to many experts, weight-bearing activities like running can prevent osteoporosis and osteoarthritis in the knees. The reason is because repetitive motions are great for the joints in your knee. Frequent running does just that. If you are a runner with lean wait, you stand a better chance of strengthening your joining and bones, which ultimately equates to stronger knees. The constant motion from frequent running has been shown to promote more fluid in your knees, which ultimately keeps them moving smoothly. Is running on a treadmill bad for knees? There is a common myth floating about that running on the treadmill is extremely bad for your knees. The reality is that like running outside, the treadmill is only bad for your knees when used incorrectly. In order to protect your knees, focus on your form during your run on the treadmill. While you are running, your posture should always be relaxed and upright. While you are engaging your core and shoulders during the run, remember to land on the balls of your feet not on your heels. When you land on the balls of your feet, your body has a chance to distribute shock appropriately. Regardless of how fast you choose to run, your knees should be bent at all times. If you would like work on your form on the treadmill, we recommend a coach or trainer who can watch you run and provide tips to improve your form. Keep in mind that a treadmill running session should speed up gradually. Make sure that you warm up by starting off slowly. Once you have settled into a proper running form, you can safely increase your speed. During your run on the treadmill, feel free to adjust the speed as necessary to accommodate your knees and body. Always remember that the result of increasing your speed too quickly is often times a knee injury. A treadmill run is not the time to aim for ridiculously high running goals. Instead of pushing past your comfort zone, try focusing on longer and slower runs. These types of runs are more natural, which means that you are less likely to develop a knee injury. More often than not, running on a treadmill every single day of the week will eventually harm your knees. Most experts recommend that you run on the treadmill up to five days per a week, but make sure that you have conditioned properly before the run. If you feel some twinges of pain in your knee after running on the treadmill, we urge you to give your body a couple days of rest. Is road running bad for knees? Most experts believe that running on hard surfaces such as the road may cause bad knees. That’s because when you are running on concrete, your feet only touch the ground for a split second. As a result, your knees don’t have much time to properly bend so that the impact can be absorbed. How to treat knee pain while running? If you have experienced pain in your knees while running, then you know how difficult it can be to finish your activity. We have been there, so we know that this is never fun. To treat knee pain, most experts suggest that you should give yourself plenty of rest and reduce the number of miles you run each day. You should also ice your knee often to mitigate the inflammation. In addition, there are many anti-inflammatory drugs that can help with reducing the swelling in your knee. Throughout the day, work on strengthening your knee with a variety of exercises. Some simple exercises that have been shown to support and stabilize the knee cap are straight leg raises, hamstring stretches, and forward lunges. While you can keep running, you may want to consider cutting your run short as soon as you experience any pain in your knee. Make sure that you avoid running on hills and uneven surfaces. Of course, if your knee pain is unbearable, you should avoid running all together. To prevent further damage to your knee in the future, you should always ensure that you are wearing the right running shoes for your foot type. If you continue to have problems with your knee, you may need to visit a doctor and a physical therapist. What are good exercises for runners with bad knees? There are many great exercises for runners who are suffering from bad knees. The starting position for this exercise is on your side with your legs fully extended. Place your supporting arm right under your head. Begin the exercise by lifting your top leg about seven inches from the floor and then lower back down. Do this 20 times and then switch sides. Start with your feet firmly pressed together. While balancing on your right foot, swing your left leg in front of the right then swing it out to the left side. Do this 10 times and then repeat with the right leg. Place a mat down on a hard surface. Start on all fours. Remove two balance points by reaching your right arm and left leg out to form a full extension of the torso. The limbs that you are extending should be parallel to the ground and ceiling. Hold the extended pose for two seconds before lowering your limbs to starting position. Repeat this exercise for nine times and then switch sides. If you want to perfect the bird dog exercise, check out this video from the National Training Center here. As the person in the video brings his legs to his core, you can really see how this might strengthen your knees. Place right foot between your hands and then drop the left knee down on the mat. Make sure that your front knee is over the ankle. You should now be in a comfortable lunge position. As you lean down, place your fingertips on the mat on either side of your right foot. Hold this pose for about ten second and then return to the starting position. Do this three times before switching sides.